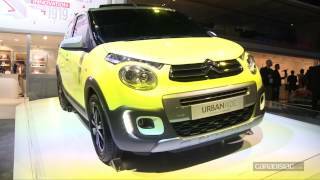 At the Paris Motor Show 2014, Citroen displayed it’s all new Citroen C1 Urban Ride Concept 2014. The rugged little hatchback looks extremely gorgeous with its new design language and is expected to ‘rule the market’ if presented with same traits in its production model. The Concept was featured with C4 Cactus, Citroen C1 and C4 Picasso which are already a renowned name in automotive industry. 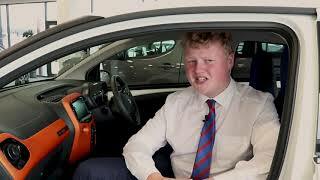 Let us have a look at the review of Citroen C1 URBAN RIDE Concept 2014 to know about it better. The Citroen C1 URBAN RIDE Concept 2014 has been introduced in two versions namely; 5-door hardtop and Airscape. The latter comes with a retracting roof while the former looks gorgeous with its black panorama roof. The compact city car is well portrayed through its rugged looks and is anticipated to define the city ride in a new way. Though there isn’t enough information about the material and engine but the raised riding height, with its suspensions being lifted to 0.6 inches and hike in track width by 0.4 inches, Citroen C1 URBAN RIDE Concept 2014 looks truly amazing. Complementing this entire look concept came drenched in yellow paint, which looked pretty. 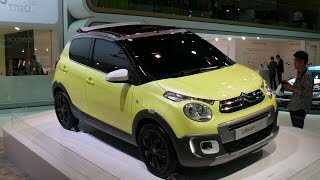 Adding more in the list Citroen C1 URBAN RIDE Concept 2014 review regarding the exterior details include black cladding over front bumper, side sills and wheel arches. This won’t just provide protection to the lower part of body but also adds commendably to the looks. 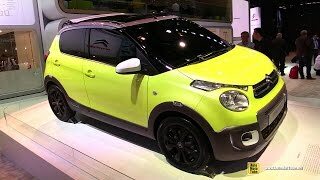 Rolling the entire body of Citroen C1 URBAN RIDE Concept 2014 you’ll notice eye-popping black wheels which look extremely aggressive and sporty. 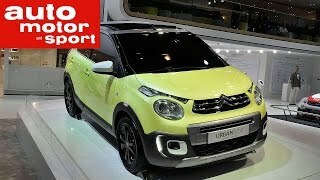 Summing up the details of Citroen C1 URBAN RIDE Concept all we can say is (due to lack of information shared), that if the concept comes the same way as a production model, it has all the chances to take the French automaker to new golden height.